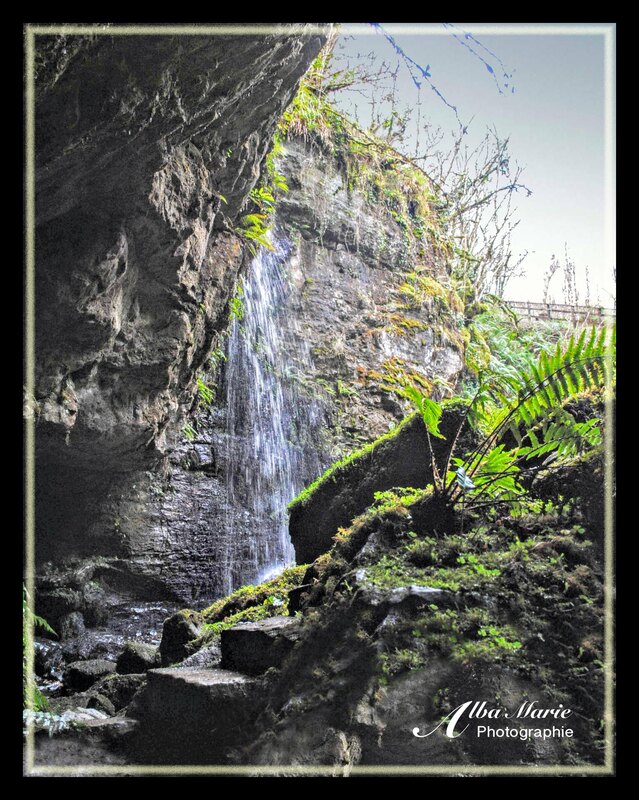 Hidden away in the little-known County Fermangh along the Ireland–Northern Ireland border is the Marble Arch geopark and the Boho Caves. Buried within the hollowed hills is a collection of limestone caves. Some caves can be visited – such as those in the Marble Arch geopark – while others are harder to find. Pollenagollum Cave is one of those subterranean worlds that few discover – and those who do are not disappointed. Located in Belmore Mountain Park, Pollenagollum Cave (meaning “hole of the doves”) bores into the face of a small 12-metre-high cliff, its mouth at the bottom of a graceful waterfall. The cave itself goes back about 2 km, where there is another entrance in the hollowed-out hills of Marble Arch, though an underground stream makes the cave impassible (only the first kilometre or so is unblocked). Pollenagollumm Cave’s claim to fame is quite recent – it was here that, in the much-loved Game of Thrones TV Series, the scene in which Beric Dondarrian had Arya and her companions where brought to his underground hideout was filmed! The limestone cave is impressive, and the surrounding Belmore Forest and quarry is tranquil and beautiful. Pro tip: The whole loop in Belmore Forest is about 7km, though the cave is only about 1km along the trail. There is also a stone marked with neolithic-era Curvilinear art not far off the path, but isn’t well marked. Please note that access to the cave is by permission only – some speleology associations may be able to bring curious visitors. Otherwise, there is a viewpoint just about the cave and waterfall for those who simply want to enjoy the panorama. From most cities, one must drive a long distance to find wild landscapes, but just 15 minutes from Belfast, there lies the magnificent Cave Hill. 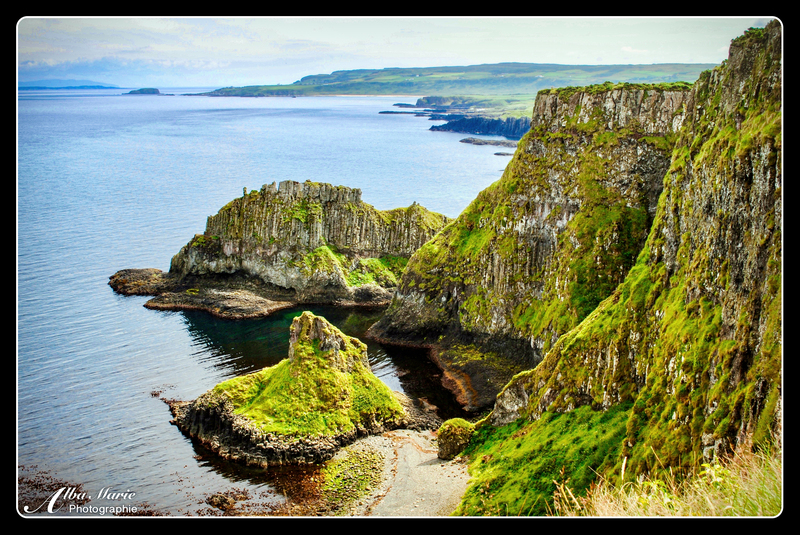 It is easy to see why fantasy writer CS Lewis – born and raised near Belfast despite spending his adult life in Oxford – gained his inspiration for the fantastic landscapes of his imaginary land of Narnia from Northern Ireland (just look at the bizarre Causeway Coast!). 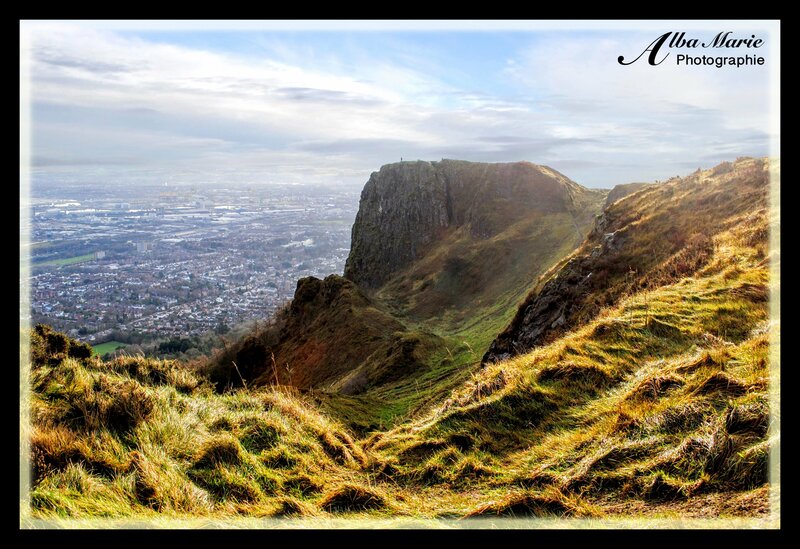 Cave Hill – part of Cave Hill Country Park – overlooks Belfast and yet transport the hiker into another world. With woodland paths starting from Belfast Castle, weave through the moss-covered forests until suddenly you emerge into a clearing facing the magnificent caves that lent the name to hill. Rolling hills, emerald greens, brilliant yellows, rugged rock faces – one almost expects to see a satyr or dwarf making its home in the cave! But it’s not over just yet – follow the path around the hill to the top for this epic view of the hill itself and Belfast sprawled below. On the narrow outcrop in the distance are the remains of an iron are fort – McArt’s Fort. Little is left today (just a few rocks, really), and its exposed position suggests that this rath (ringfort) was only ever used for defensive purposes. Thousands of years later, McArt’s Fort became the secret meeting place of United Irishmen to plot their famed – and doomed – attack in the rebellion of 1798 (when the Irish rose against the oppressive forces of the British nobility and military. The rebellion failed, and caused a large loss of life on the Irish side). Because Cave Hill is near Belfast, it can get busy but even with other hikers enjoying the views alongside you, this place emits a magic that cannot be rivalled. Pro tip: Start your hike at Belfast Castle, and follow the signs for the Cave path. The first part is muddy in places, and there are a few steep bits so wear a proper pair of hiking boots. The whole walk is about 7km. There is also a “family friendly” trail starting from another car park on the backside of the hill, but this means you’ll miss most of the good stuff, and it’s not a looped path. 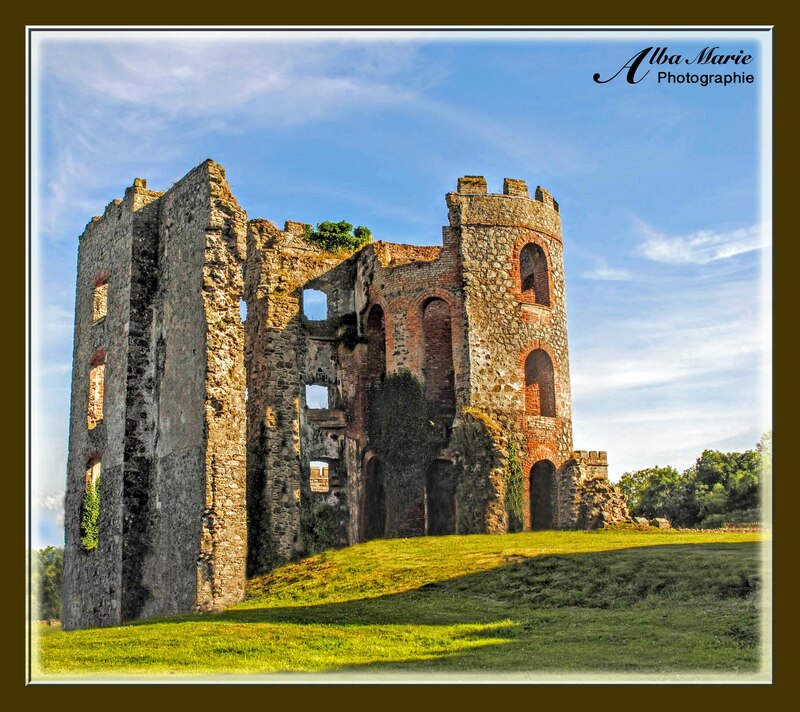 On the shores of Lough Neagh (Ireland’s largest lake, though far from its most interesting one…), Shane’s Castle is one of the most fascinating castle ruins on the Emerald Isle. Built in 1345 by the O’Neill dynasty (one of the major family clans in Ulster, the northern half of Ireland), the original name was actually Eden-duff-carrick – only becoming the far more catchier “Shane’s Castle” in 1722 when Shane MacBrien O’Neill changed its name to suit him. Today, the castle is famous for its many uses in HBO’s Game of Thrones TV series. Though largely ruins, most visitors to Shane’s Castle will miss the most fascinating part (only accessible through certain tours and events): the huge network of tunnels, caves and catacombs twisting underneath the castle’s foundations! Dark and windy, these tunnels featured in several GoT scenes. Not far way, the infamous Battle of Antrim was fought on on 7 June 1798 as an unsuccessful rebellion of Irish peasants against the British Rule (the Republic of Ireland only managed to get independence from Great Britain in 1922 after years of fighting, and obviously Northern Ireland is still a region within the UK). Though this can still be a contentious subject in Ireland (both north & south), a lot has changed in recent years making the whole island a fun and safe destination. Pro tip: Every year in July, the grounds of Shane’s Castle holds Ireland’s largest Country & Game Fair, including living history and reenactments – well worth the visit! The event includes is a historical component showcasing ways of living in the past, from the Viking age through to modern times, with a reenactment of the Battle of Antrim. Belfast is known for a lot of things. It’s known for struggles, religious and political unrest, even for terror. But a lot has changed in recent years. Belfast has become a cosmopolitan hub, with an up-and-coming foodie scene that surpasses Dublin and rivals other European capitals. It’s a quirky place where art meets urban life in the best possible ways. For one, there are the Peace Walls. Massive walls that divides the Catholic and Protestant neighbourhoods, Peace Walls were constructed to protect each side from the other but at the end of the day, it is a barrier through the middle of the city dividing the two sides (not unlike the Berlin Wall once did). Today the wall is still there and the sides are still divided but the wall is now a Peace Wall, full of thousands of messages of hope and courage written by residents and visitors alike, and the two sides have come together much more. But that’s not the only wall in Belfast. 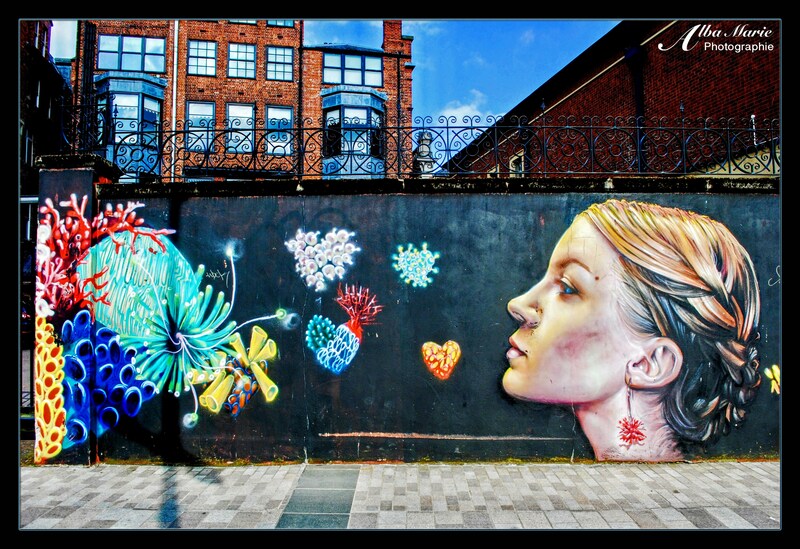 The city of Belfast is full of murals. Some are well known, others aren’t. Some are religious or political, some are artistic. Some are massive, others small. The above mural is one of the many one finds in the city centre, ‘neutral’ territory where both Protestants (aka unionists) and Catholics (aka republicans) rub shoulders. 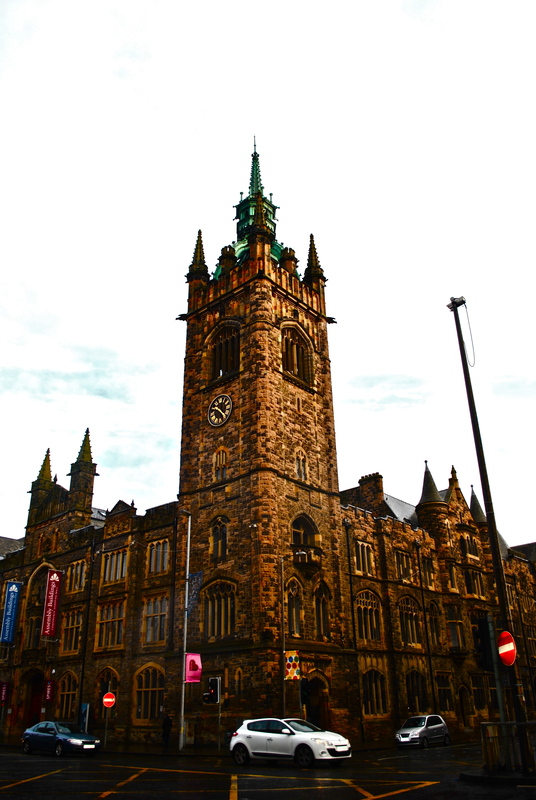 Belfast is still a divided city, and though on the island of Ireland, it resembles England far more than Ireland (in regards to architecture, way of life, fashions, shop brands…). Yet despite this – or perhaps because of this – it is a fascinating place to visit. Particularly the murals! Pro tip: To truly appreciate Belfast, its history and its murals, take one of the famous Black Cab tours – Paddy Campbell’s is the original and the best! Yes, this glittering building in Northern Ireland is different than the Republic of Ireland (Dublin, Cork, Limerick, Galway, etc). Same island, different government. Here, they use the pound, measure things in miles, and are supposedly ruled by the Queen. Northern Ireland was created in 1921 because unlike the Republic of Ireland to the south, the majority of the population of Northern Ireland (then) wanted to stay part of the UK, as many of them were Protestants. However, the Catholics wanted a united Ireland. Because of this religious and political divide, acts of violence rang out, including the infamous Bloody Sunday (Derry, Northern Ireland), where 26 unarmed protesters were gunned down by the British Army (14 died). It seems that most of the Catholic/Protestant violence has died down today. The Republic of Ireland doesn’t much like the queen, and still organises events to protest that the 6 northern counties haven’t yet became part of the Republic. Today’s Belfast is a small, quiet town by day, known for its nightlife, for providing the world with Van Morrison, Seamus Heaney, and Liam Neeson, and for the building of the Titanic (though this last feat is not something that I’D necessarily be very proud of! ).